Maître Parfumeur et Gantier's Jasmin is from Les Fleurs Divines collection - which seems to be a dedicated to soliflore fragrances. This particular perfume was inspired by the jasmine plantations near Fez in Morocco. Jasmin begins with a musky-woody jasmine accord, a tad rosy with a hint of tart citrus - almost lemony but note quite. There are particular aspects of jasmine that seem to dominate in this composition, namely the animalic/indolic part, and a fruity note that gives off a suade-like texture, like peach's fuzz (perhaps undecalactone, or so-called aldehyde C-14). 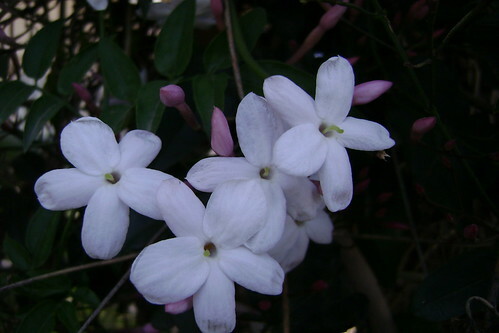 Jasmin is very pretty, delicate and ethereal but still with some substance. It reminds me a lot of Yvresse (formerly Champagne) by YSL, with its sparkling, fuzzy peach top notes - fruity but also slightly milky and skin-like. But it's more subtle and less obviously Chypre (the moss here is just a tiny hint). Another surprising similarity is to Petit Guerlain, of all things - a similarity that becomes more apparent in the dry down, which makes me wonder if there is any lavender as well hidden in its formula. Jasmin also brings to mind of Narcotic Flower by 1000 Flowers, which also has similar fruity and indolic accents only it's more light and less of a beachy Floriental. It is more like a garden on a humid, rainy summer day. There is no big statement in Jasmin. It's beautiful, and that is enough. In addition, there is more authenticity to it than most of the jasmine fragrances I've smelled so far. The photo above is of a Jasminum officinale that I've photographed in Jerusalem many years ago and titled "Peach-scented Jasmine". Jasmine truly can smell quite peachy!